" USA "Inverted Jenny" plate block sells for $4 million!" Used last year - value $272,000! The stamp market is going absolutely nuts at the top end. As I reported in my August column, a used recent German stamp sold for $A112,000 on June 1. The stamp was used on German domestic letter rate mail in October 2003. I predicted then we had entered a stamp boom starting June 1 2005, and gave several other examples of why, and two recent auctions have further borne this out. Another copy of this 110+50 pfennig German stamp was since discovered in kiloware and has just sold for over DOUBLE that June price! I thank "Linn's Stamp News" for bringing this to my notice, and assistance with the photos. 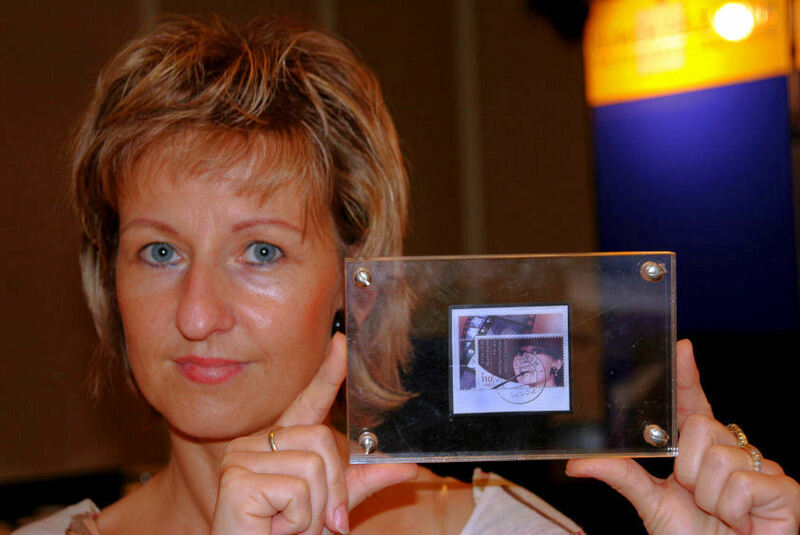 As television cameras recorded the occasion, a used example of Germany’s unissued Audrey Hepburn stamp was hammered down October 7 for 135,000 Euro. With commissions and taxes, the buyer paid a total of 169,000 Euro (=$A272,000). This realisation easily breaks the price record for a post-war German stamp. Indeed I imagine it is easily a price record for ANY single stamp or even multiple issued anywhere post-war. This stamp, the recently discovered third example known in collector hands, was the star lot in Ulrich Felzmann’s 111th auction held October 5-8 in Dusseldorf, Germany. Felzmann is not to be confused with the similarly named David Feldman Auctions in Switzerland, who also sells many rare pieces. Ulrich Felzmann has advised that the buyer’s invoice including all costs amounted to Euro 169,000. Axel Doerrenbach from the company told me the stamp has already been paid for and personally delivered to the new owners. The stamp was purchased by Gaby Bennewirtz, acting on behalf of her husband Gerd Bennewirtz, an investment manager and stamp collector - also living in the Dusseldorf area. Shown nearby is winning bidder Gaby Bennewirtz holding the now famous $A272,000 stamp, and her and the auctioneer holding up a giant poster enlargement. This example of the unissued Audrey Hepburn stamp has part of the top left hand corner selvedge attached from the pane of 10. The stamp is cancelled Feb. 11, 2004, at Kleinmachnow, a suburb of Berlin. According to the lot description in the auction catalog, the stamp was found in kiloware, a mixture of postally used stamps on clipped envelope corners. In Europe and elsewhere, such stamps are often sold unsorted by the kilogram, hence the name. 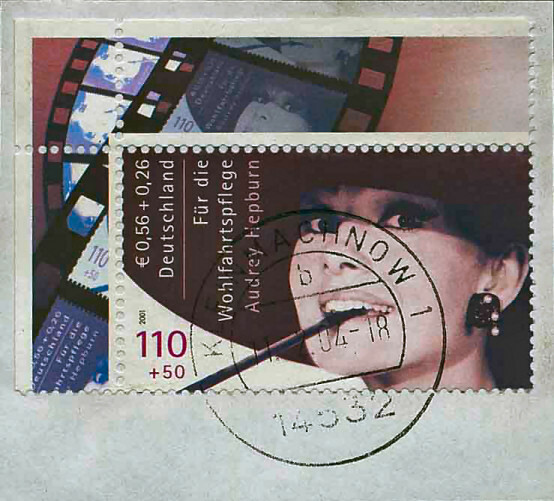 The story of the Hepburn stamp began in 2001 when the German post office (Deutsche Post) prepared to issue a set of semi-postal stamps featuring movie stars, including Audrey Hepburn, as panes of 10 (two of each of the 5 stamps) and a booklet pane that resembles a souvenir sheet. As I reported in my August column, at the last minute one of Hepburn’s sons objected to the Hepburn stamp. Possibly as an image of his mother smoking was not one he approved of. (Hepburn died of cancer in 1993.) A 37¢ USA Hepburn stamp (without cigarette) was issued without incident in June 2003. The German post office ordered that all the Audrey Hepburn stamps be destroyed. The issue was re-designed and eventually released October 11, 2001.
depicted Marilyn Monroe, Jean Gabin, and Charlie Chaplin. Three panes of 10 stamps each had already been sent to the German Ministry of Finance, but it is believed that they were not returned and not destroyed. The whereabouts of all these 30 stamps today is not known. I presume the 6 x Bogart/Bergman stamps must also exist in kiloware? Three years later, in late 2004, the first used example of the Hepburn stamp was discovered by Werner Duerrschmidt, a stamp collector and mailman in Bavaria, a German state. He found the stamp in a mixture of used on-paper stamps sent to him by friends. Duerrschmidt’s example was cancelled Berlin, October 14, 2003. This was reported as front page news in German stamp magazines dated February 2005 calling it a 'Sensation Perfekt!'. On January 5 Herr Duerrschmidt and the 'Alliance of German Philatelists' (Bund Deutscher Philatelisten) exhibited the sensational discovery in the “House of Philately And Postal History“ in Bonn, to the public. A number of Daily Newspapers, Radio and TV stations covered this event. The stamp became quite a media icon, and dealer and collector bodies reported the widespread press has proven very positive for philately in Germany. After the national media circus that this initial find predicated, another copy was found, postmarked Berlin November 2, 2003. This example was discovered by a collector in Frankfurt am Main. It was found among stamp clippings he received from the incoming mail of a company in Wolfsburg, Germany. This latter stamp was invoiced for Euro 69,437.60 (approximately $A112,000) when it was auctioned June 1 by Heinrich Kohler in Wiesbaden, Germany. It was on the front cover of the August 2005 "Stamp News". A third stamp discovered SHOULD have meant the price of all three went down, not up, as each new discovery lessens the potential value of all copies - that is the conventional thinking. Axel Doerrenbach from the Felzmann auctioneers told Linn’s of the discovery of the third example of the unissued stamp: “this stamp is from the left upper corner and shows a diligent illustration on the margin: a multiple repetition of the stamp itself resembling a piece from a film reel. Also this piece is still on a paper cut-out. “Since a complete pane of 10 shows this illustration only on the margins of the upper-left corner, this piece is unique. This is the piece which we sold during our recent auction ... it fetched Euro 169,000. The Ulrich Felzmann firm reported that the auction floor was crowded with television crew, as well as radio and newspaper reporters before the Audrey Hepburn stamp was opened at a starting bid of Euro 50,000. The auction house described the scene: “An internationally well-known bidding agent Jochen Heddergott from Munich, enters into the struggle: €52,000, €54,000. €60,000. "A telephone bidder quits. ‘No way,’ he sighs. The bidding agent is acting on behalf of an overseas customer. “A lady in the audience shows no intention to give up. Both the lady and the agent have their seats in the front row. And their eyes meet each others. €90,000, €92,000 .... who will surrender? “Once the €100,000 borderline has been crossed the audience gives a big cheer ..... but the fight goes on. “Now the bid increments are €5,000 each. And the bidding is continuing. The agent’s maximum bid is €130,000. But the lady in the floral dress keeps her bidding card straight up. Her final bid: €135,000. And she is the winner! "Congratulations, flash lights, interviews. The winner is Mrs Gaby Bennewirtz. She acted on behalf of her husband, the investment manager Gerd Bennewirtz who is the managing director and share holder of a company named SJB FondsSkyline OHG 1989, located nearby in Dusseldorf. "Gerd Bennewirtz is not only a professional financial investment manager but also a stamp connoisseur who has got a certain vision for this stamp rarity: a capital investment, a collector’s piece, a thrill for stamp-lovers and Audrey fans. "The invoice including all costs and tax amounted to 169,000 Euros" Doerrenbach concluded. Alex Doerrenbach emailed me October 28 and said: "the invoice for the stamp had been paid and the Auction proprietor Mr Felzmann, senior philatelist Mr Such and myself personally delivered the stamp to the buyer on Friday October 21, 2005.
broadcast on the Eastern Japanese railways. "On the day after the auction, the news of this record hammer price has been published in 122 German newspapers. A recent stamp used on local mail only last year getting $A272,000 just seems insane to me. The example that sold a few months ago for $A112,000 also seemed insane to me too at the time. That buyer must be already laughing all the way to the bank! His wise purchase has clearly more than doubled in value in the 4 months since June. The NEXT copy to turn up will be an interesting market test. Don't forget my case of Krug if you find one! Only a week or so later an even more remarkable price realisation was to take place on the other side of the Atlantic. A block of four rare USA 'Inverted Jenny' 24¢ Airmail stamps sold October 19 in New York for $US2.97 million, easily the highest price ever paid for any United States stamp item. The block is the only one in existence that features the plate number upside down and in the stamp selvedge, said Scott Trepel, president of Siegel Auction Galleries who sold it this month. 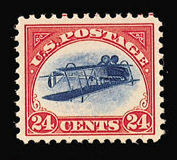 The misprinted 1918 block, depicting an upside-down bi-plane, was sold to an anonymous collector, the auction house advised. With the 10 percent buyer's premium added on, the final invoice price was $US2.97 million. That converts to virtually $A4 million as this column is typed. Seller was a "US broadcast executive" who paid $US1.1 million in 1989. The "Jenny" stamps depict a Curtiss JN-4 "Jenny" a World War I training aircraft that later became an airmail plane. About 700 of the stamps were misprinted but postal inspectors caught all of but 100 of the mistakes before they were sold. The entire pane of 100 was bought at face value by stamp collector William Robey on May 14, 1918 at a Washington post office. It was later sold and separated into individual stamps and blocks. This as we all know is a stamp of some legend. It is not even especially 'Rare' as the entire error sheet purchased at a Post Office by Robey went immediately into philatelic hands at hefty prices, where they nearly all remain today. When I attended 'Pacific 97' in San Francisco I took a photo (and published it here) of dealer Harry Hagendorf holding up one of three BLOCKS of 4 of this stamp on his stand for sale! Another dealer had 2 copies, and a European dealer displayed yet another block of 4. Eighteen examples on sale in one place does NOT make it 'rare' by any definition. Scarce - yes, famous - yes, but many stamps are known with only 1 or 2 copies existing. THEY are "Rare". Nonetheless, this "glamour" stamp gets high prices wherever offered. In October 1998 leading New York auction house Robert Siegel auctioned the Robert Zoellner USA collection - the ONLY complete (by Scott) collection of every USA stamp ever to be offered. Lot 722 was an attractive hinged mint copy of the 'Inverted Jenny' which sold then for $US175,000 + 10% = $US192,500 ... then a remarkable price for a twentieth century stamp from anywhere. The price attracted much media attention and comment. The same auction house auctioned the exact same stamp on June 2 this year. The 'Inverted Jenny' was offered with an estimate of $US170,000 - almost the same hammer price it had last sold for. The final price after frenzied bidding was $US525,000 + 10% = $US577,500 or then $A778,354. This is exactly THREE times the record price obtained only a few years before. Same auction house, same stamp, and obviously nearly the same mailing list of catalogue recipients. This was without doubt the flashing neon sign that we had entered a stamp boom for top end stamps, the like of which we have not seen for 25 years. Heck this stamp was not even mint unhinged, of which many exist. This new price of $A4 million on this block of 4 is just nuts .... or so it seems to me. In a few years it will of course be $A10 million, and the current buyer will be smiling. The worldwide publicity BOTH pieces achieved will do enormous good for the stamp hobby. Want to see (or print out) this column EXACTLY as it appears in 'Stamp News'? If so click sndecember05.pdf allow 30 sec for downloading the pdf just "Right mouse click on the link and select SaveAs." You will need the Adobe Reader program installed to view it. Adobe Reader is a FREE application and may be downloaded safely from here. v 7.0 is the latest release, get it now. Get my regular market update emails FREE. Stamp gossip, price trends, record sale prices, and many one-time stamp specials, wholesale bargains, and exciting offers and breaking philatelic news. A mini stamp magazine in every email! "KNOWLEDGE IS POWER". The ONE stamp list you MUST be on, to keep in touch with the rapidly changing world market. One client made $65,000 profit in a few months after following my specific advice. Sign up securely and quickly by clicking HERE to access my automated data base. And wiser still ADD your home AND work email, if I only have one right now. Add a stamp friend's email address if you wish. One short click and you are subscribed to probably the most read email list in the stamp world! FREE! Just click here... see exactly what my lots cost in your currency. Full Time Stamp Dealer in Australia for over 25 years. Time and Temp in Sunny Sydney! ALL Postage + Insurance is extra. Visa/BankCard/MasterCard/Diners/Amex all OK, even for "Lay-Bys"! All lots offered are subject to my usual Conditions of Sale, copy upon request BIGGEST STAMP BUYER: Post me ANYTHING via Registered Mail for my same-day cheque. Avoid the GENERALLY 40% Auction " Commissions" (15% + 17½ + GST, etc.) AND their five-month delays! Read this for details. Sign up AUTOMATICALLY to my world renowned bi-weekly stamp gossip mailing list! Click here for the current Monthly "Internet Only" special offers - CHEAP! Click HERE to read all my recent International stamp magazine articles. Click here for the complete library of my very unusual world travels! How to PAY me. I accept EVERYTHING - even blankets and axes and beads! Australia Post Annual YEAR BOOKS - massive stock - '27% off' discount offer today! Visit my new page on RARITIES - Roos & other expensive photo items. Every credit card shown is accepted WITHOUT fee. Earn Frequent Flier points while buying at bargain prices! "Buyer's Commission" on stamps like nearly every "Auction" does.